Having a non-standard default shell will cause problems and does not allow us to set global environmental defaults for everyone. As of Odyssey3 we will no longer change the default shell on any account or support the use of alternate shells as default login shell. Users who do not have bash as their default login shell will need to change back to bash. Users can, of course, still launch an alternate shell once logged in. 1.7 What happens to my account when I leave/graduate? 1.8 How do I request membership in an additional lab group? 1.9 Can I use SSH keys to log in without a password? 1.10 How do I get a Research Computing account? 1.14 How do I login to Odyssey? 1.15 How do I reset my Research Computing account password? 1.16 How do I unlock my locked Research Computing account? 1.17 How do I install and launch OpenAuth? 1.18 How do I logon to the Research Computing VPN? 2.2 How do I request membership in an additional lab group? 2.3 What’s the best way to transfer my data? 2.4 How do I access my Odyssey home directory from my laptop? 2.5 How do I check how much space I’ve used? 2.6 How much space do I have in my home directory? 2.7 I accidentally deleted my data, how do I get it back? 2.8 Why are all my files executable? 2.9 Why does my UMASK not work? 2.10 Is my home directory available as a network filesystem share? 3.3 How do I load a module or software on Odyssey? 3.6 How do I run a Matlab script on Odyssey? 4.1 How do I know what memory limit to put on my job? 4.2 How can I check OS version when loading modules? 4.3 How do I figure out how efficient my job is? 4.4 Will single core/thread jobs run faster on the cluster? 4.6 How do I request membership in an additional lab group? 4.7 Can I query SLURM programmatically? 4.8 How do I fairly manage dual/multiple lab affiliations for work on Odyssey? 4.9 Are their policies or guidelines for using the cluster responsibly? 4.10 How do I submit a batch job to the Odyssey queue SLURM? 4.11 How do I submit an interactive job to the Odyssey queue SLURM? 4.12 How do I view or monitor a submitted job? 4.13 My job is PENDING. How can I fix this? 4.19 SLURM errors: Socket timed out. What? 5.2 Still need help transitioning to CentOS 7? During SFTP connections, your .bashrc will be evaluated just as if you were logging in via SSH. If you've added anything to your .bashrc that attempts to echo to the terminal/standard out, this will cause your SFTP client to hang and then disconnect. echo “SFTP connections won’t evaluate the things inside this clause." What happens to my account when I leave/graduate? Your RC account is only valid while sponsored by an eligible faculty member. Once you leave the university, your account is subject to closure. In order for a leaving user to continue to keep an open RC account, FAS RC will need a record of the sponsor's direct OK to continue. If you need to continue access after leaving, please have your PI/sponsor contact us (via our Portal or by emailing rchelp@rc.fas.harvard.edu from their university email account.) Please understand that a forwarded email is not sufficient as this could be easily forged by someone attempting to game the system. Can I use SSH keys to log in without a password? No. Our cluster login relies on two-factor authentication. This makes using key-based authentication impractical. How do I get a Research Computing account? If you are unsure whether you qualify for an RC account, please see Qualifications and Affiliations. More information on using the signup tool can be found here. Please Note: You may have only one RC account. If you need to add cluster access or membership in a different/additional lab group, please submit a help ticket. Please do not sign up for a second account. This is unnecessary and against our account policies. PLEASE NOTE: Do not select FACULTY as your job type is you do not have a faculty appointment. If you are a researcher with additional rights (fellowship, PI-like rights, funding, etc. ), please select STAFF or POSTDOC. Faculty accounts are intended only for those holding an active Associate Professor or higher appointment. The request is on hold while the PI is asked to approve or reject it. NOTE: New PI/Faculty signups require additional vetting and will take longer. Once approved, the account is finalized and set up. Once finalized, you receive an automated email confirmation with your new account information and instructions for setting the password. The request goes to RC personnel to check that it is complete and meets affiliation requirements. Once approved by RC, an email is sent to your PI to approve/reject the request. Once approved, we finalize the account on our side (during business hours). Once finalized, you receive an automated email confirmation with your new account information and instructions for setting the password..
You can then proceed to set up your OpenAuth token and get connected to Odyssey. The turnaround time is directly related to the PI/Sponsor's approval of the account. External accounts are reviewed by RC staff during business hours and turnaround will depend on our current load. Generally these are vetted and sent on to the PI/Sponsor for their approval within one business day. NOTE! If you request "Odyssey Cluster Use" (the ability to run jobs on the cluster), you are required to complete the online Introduction to Odyssey course within 45 days of your account being issued. The sharing of passwords or login credentials is not allowed under RC and Harvard information security policies. Please bear in mind that this policy also protects the end-user. Sharing credentials removes plausible deniability for the account holder in case of account misuse. Accounts which are in violation of this policy may be disabled or otherwise limited. If you find that you need to share resources among multiple individuals, please contact us and we will be happy to assist you with finding a safe and secure way to do so. Step 1: Launch the OpenAuth application. For instructions on how to install and launch OpenAuth please see here. Step 2: Launch a Terminal application. USERNAME is the name you were assigned when you received your Research Computing account. (Add -Y if you have an X11 server installed and desire graphics support.) If you are on Windows, download PuTTY or your favorite ssh software and connect to login.rc.fas.harvard.edu. You will be asked for your Research Computing password and OpenAuth Verification Code upon connecting. The hostname login.rc.fas.harvard.edu is a round-robin to some of our hosts named holylogin##.rc.fas.harvard.edu or boslogin##.rc.fas.harvard.edu, so that is what you will see in your shell prompt once connected. Note: In certain instances you will need to be logged on to the Research Computing VPN to access Odyssey. Please see the VPN setup page for instructions on how to logon to the Research Computing VPN. For more details on access to the Odyssey cluster see the Access and Login page. How do I reset my Research Computing account password? Please click here to reset your Research Computing account password using your email address. This will send an email to you with a one-time use link to set a new password. Please note: Your username is not your email address. Your email address is used here only for password resets and to contact you. How do I unlock my locked Research Computing account? Once your account is locked, your account will automatically unlock after 5 minutes. How do I install and launch OpenAuth? If you do not yet have an account, see: How do I get a Research Computing account? Visit https://software.rc.fas.harvard.edu/oa to start setup of OpenAuth. After logging in, allow a few seconds as the site generates your token. Since the site uses email verification to authenticate you, you must also have a valid account and email address on record with Research Computing. All OpenAuth tokens are software-based, and you will choose whether to use a smart phone or java desktop app to generate your verification codes. Java 1.6 or higher is required for the desktop app. You will need to use OpenAuth when accessing the Research Computing VPN and logging into the FAS RC cluster. Please see our VPN setup guide here. Linux users please see our guide to using OpenVPN here. Please contact us if you require Gaussian access. It is controlled on a case-by-case basis and requires membership in a security group. To see all available versions of Gaussian, visit the Portal Module Search and Search for 'gaussian'. How do I know what memory limit to put on my job? where JOBID is the one you’re interested in. The number is in KB, so divide by 1024 to get a rough idea of what to use with –mem (set it to something a little larger than that, since you’re defining a hard upper limit). How can I check OS version when loading modules? If you need to check what OS version the node you are on is using before loading modules, you can add a test in your .bashrc for the value of the environment variableFASRCSW_OS . How do I figure out how efficient my job is? In this job you see that the user used 64 cores and their job ran for 13 hours. However their CPUTime is 35.5 hours which is close to 64*13 hours. If your code is scaling effectively CPUTime = NCPUS * Elapsed. If it is not that number will diverge. The best way to test this is to do some scaling tests. There are two styles you can do. Strong scaling is where you leave the problem size the same but increase the number of cores. If your code scales well it should take less time proportional to the number of cores you use. The other is weak scaling where the amount of work per core remains the same but you increase the number of cores, so the size of the job scales proportionally to the number of cores. Thus if your code scales in this case the run time should remain the same. Typically most codes have a point where the scaling breaks down due to inefficiencies in the code. Thus beyond that point there is not any benefit to increasing the number of cores you throw at the problem. That's the point you want to look for. This is most easily seen by plotting log of the number of cores vs. log of the runtime. The other factor that is important in a scheduling environment is that the more cores you ask for the longer your job will pend for as the scheduler has to find more room for you. Thus you need to find the sweet spot where you minimize both your runtime and how long you pend in the queue for. For example it may be the case that if you asked for 32 cores your job would take a day to run but pend for 2 hours, but if you ask for 64 cores your job would take half a day to run but would pend for 2 days. Thus it would have been better to ask for 32 cores even though the job is slower. Will single core/thread jobs run faster on the cluster? The cluster cores, in general, will not be any faster than the ones in your workstation, in fact they may be slower if your workstation is relatively new. While we have a variety of chipsets available on the cluster, most of the cores are AMD and will be slower than many Intel chips, which are most common in modern desktops and laptops. The reason we use so many AMD chips is that we could purchase a larger number of cores and RAM this way. This is the power of the cluster. The cluster isn't designed to run a single core code as fast as possible as the chips to do that are expensive. Rather you trade off raw chip speed for core count. Then you gain speed and efficiency via parallelism. So the cluster excels at multicore jobs (using threads or MPI ranks) or doing many jobs that take a single core (such as parameter sweeps or image process). This way you leverage the parallel nature of the cluster and the 60,000 cores available. So if you have a single job, the cluster isn't really a gain. If you have lots of jobs you need to get done, or your job is too large to fit on a single machine (due to RAM or its parallel nature), the cluster is the place to go. The cluster can also be useful for offloading work from your workstation. That way you can use your workstation cores for other tasks and offload the longer running work onto the cluster. In addition since the cluster cores are a different architecture from your workstation one needs to be aware that the code will need to be optimized differently. This is where compiler choice and compiler flags can come in handy. That way you can get the most out of both sets of cores. Even there you may not get the same performance out of the cluster as your local machine. The main processor we have on the cluster is now 4 years old, and if you are using serial_requeue you could end up on hardware bought today to stuff purchased 7 years ago. There is about a factor of 2-4 in performance in just the natural development of processor technology. We do not recommend putting multiple module loads in your .bashrc as each and every new shell you or your jobs create will call those module loads. It is recommended that you put your module loads in your job scripts so that you are not loading un-needed modules and waiting on those module calls to complete before commencing the job. Alternately, you can create a login script or alias containing your frequently used modules that you can run when you need to use them. Either way, try to keep any module loads in your .bashrc down to a bare minimum, calling only those modules that you absolutely need in each and every login or job. Additionally, as time goes on modules change or are removed. Please ensure you remove any deprecated modules from your .bashrc or other scripts. For example, the legacy modules no longer exist. So if you have a call to 'module load legacy' and any of the legacy modules, your login will be delayed as the module system searches for and then times out on those non-existent modules. Can I query SLURM programmatically? I'm writing code to keep an eye on my jobs. How can I query SLURM programmatically? We highly recommend that people writing meta-schedulers or that wish to interrogate SLURM in scripts do so using the squeue and sacct commands. We strongly recommend that your code performs these queries once every 60 seconds or longer. Using these commands contacts the master controller directly, the same process responsible for scheduling all work on the cluster. Polling more frequently, especially across all users on the cluster, will slow down response times and may bring scheduling to a crawl. Please don't. SLURM also has an API that is documented on the website of our developer partners SchedMD.com. How do I fairly manage dual/multiple lab affiliations for work on Odyssey? We're really glad you asked us this question! How you submit your jobs will determine what lab's fairshare is selected. There are two levels to this question, the first concerning filesystem rights and the second SLURM submissions. For filesystem rights, your primary group ID should be set to your primary lab group, and request from us a secondary group membership in Active Directory. If you wish to switch to the other group for work (for example, when creating files in smith_lab shared storage, you would want to make sure your group is set to smith_lab, not jones_lab), use the newgrp 2NDGROUPNAME command. In SLURM, ensure that your primary group membership is set for the appropriate lab, and request from us a secondary group affiliation in SLURM. When submitting SLURM jobs, all resource usage will be charged to your primary SLURM group. If you wish to submit jobs for the other group, using the --account=2NDGROUPNAME on the sbatch or srun command. Are their policies or guidelines for using the cluster responsibly? Yes. Please see out Customs and Responsibilities page. How do I submit a batch job to the Odyssey queue SLURM? Step 1: Login to Odyssey through your Terminal window. Please see the Access and Login page for login instructions. Step 2: Run a batch job by typing: sbatch RUNSCRIPT. Replace RUNSCRIPT with the batch script (a text file) you will use to run your code. The batch script should contain #SBATCH comments that tell SLURM how to run the job. See the batch submission section of the Running Jobs page for detailed instructions and sample batch submission scripts. How do I submit an interactive job to the Odyssey queue SLURM? This will initiate an X11 tunnel to the first node on your list. –-x11 has additional options of batch, first, last and all. See also the interactive jobs section of the Running Jobs page. How do I view or monitor a submitted job? You can view the runtime and memory usage for a past job by typing: sacct -j JOBID --format=JobID,JobName,MaxRSS,Elapsed, where JobID is the numeric job ID of a past job. See the Running Jobs page for more details on job monitoring. My job is PENDING. How can I fix this? How soon a job is scheduled is due to a combination of factors: the time requested, the resources requested (e.g. RAM, # of cores, etc), the partition, and one's FairShare score. If there is no reason, the scheduler hasn't attended to your submission yet. Resources means your job is waiting for an appropriate compute node to open. Priority indicates your priority is lower relative to others being scheduled. There are other Reason codes; see the SLURM squeue documentation for full details. Your priority is partially based on your FairShare score and determines how quickly your job is scheduled relative to others on the cluster. To see your FairShare score, enter the command sshare -u RCUSERNAME. Your effective score is the value in the last column, and, as a rule of thumb, can be assessed as lower priority ≤ 0.5 ≤ higher priority. In addition, you can see the status of a given partition and your position relative to other pending jobs in it by entering the command showq-slurm -p PARTITION -o. This will order the pending queue by priority, where jobs listed at the top are next to be scheduled. For both Resources and Priority squeue Reason output codes, consider shortening the runtime or reducing the requested resources to increase the likelihood that your job will start sooner. Please see this document for more information and this presentation for a number of troubleshooting steps. Well, usually this is a problem in which your job is trying to write to a network storage device that is busy -- probably overloaded by someone doing high amounts of I/O (input/output) where they shouldn't, usually on low throughput storage like home directories or lab disk shares. Please contact RCHelp about this problem, giving us the jobID, the filesystem you are working on, and additional details that may be relevant. We'll use this info to track down the problem (and, perhaps, the problem user(s)). If you've submitted a job to the serial_requeue partition, it is more than likely that your job will be scheduled on a purchased node that is idle. If the node owner submits jobs, SLURM will kill your job and automatically requeue it. This message will appear in your STDOUT or STDERR files you indicated with the -o or -e options. This is simply an informative message from SLURM. Your job is attempting to use more memory than you've requested for it. Either increase the amount of memory requested by --mem or --mem-per-cpuor, if possible, reduce the amount your application is trying to use. For example, many Java programs set heap space using the -Xmx JVM option. This could potentially be reduced. For jobs that require truly large amounts of memory (>256 Gb), you may need to use thebigmem SLURM partition. Genome and transcript assembly tools are commonly in this camp. See this FAQ on determining how much memory your completed batch job used under SLURM. This message may arise for a variety of reasons, but it indicates that the host on which your job was running can no longer be contacted by SLURM. Not a good sign. Contact RCHelp to help with this problem. SLURM errors: Socket timed out. What? Since SLURM is scheduling 1 job every 2 seconds (let alone doing the calculations to schedule this job on 1 of approximately 1000 compute nodes), it's going to be a bit busy at times. Don't worry. Get up, stretch, pet your cat, grab a cup of coffee, and try again. Either you did not specify enough time in your batch submission script, or you didn't specify the amount of time and SLURM assigned the default time of 10 minutes. The -t option sets time in minutes or can also take D-HH:MM form (0-12:30for 12.5 hours). Submit your job again with a longer time window. FairShare is a score that determines what priority you have in the scheduling queue for your jobs. The more jobs you run, the lower your score becomes, temporarily. A number of factors are used to determine this score -- please read this Fairshare document for more information. To find out what your score is, enter `sshare -U` in your Odyssey terminal session to see a listing for your group (this is not your individual score, but an aggregate for your group). In general, a score of 0.5 or above means you have higher priority for scheduling. For further information, see the RC fair-share document. With the upgrade of Odyssey2 to Odyssey3 and CentOS 7, there are a few things you may need to know in order to resume your work on the cluster. We've assembled an FAQ of common questions/issues. WARNING: POSSIBLE DNS SPOOFING DETECTED! 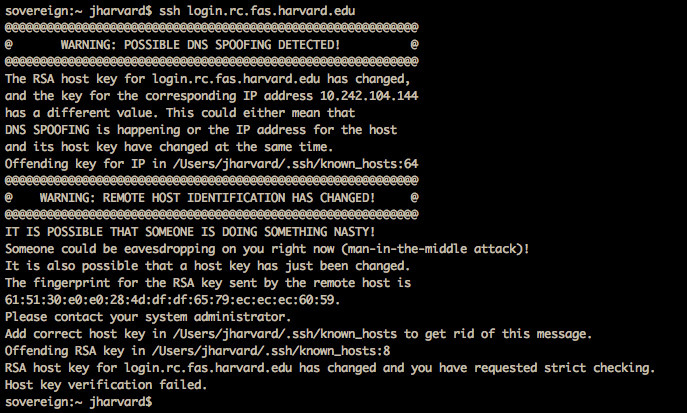 and/or The RSA host key for login.rc.fas.harvard.edu has changed error messages. After an update of nodes, such as the May 2018 upgrade to CentOS 7, the SSH key fingerprint of a node may change. This will, in turn, cause an error when you next try to log into that node as your locally stored key will no longer match. SSH uses this as a way to spot man-in-the-middle attacks or DNS spoofing. However, when a key changes for a valid reason, this does mean you need to clear out the one on your computer in order to be able to re-connect. If you have edited your .bashrc file to include module loads at login, you may find that some CentOS 6 modules will not be found or may not work on CentOS 7. You will need to edit your .bashrc and comment out or remove any such lines going forward. If you can no longer log in because of something in your .bashrc, contact us and we can rename your .bashrc and copy in a default version for you. Can I remove source new-modules.sh from my .bashrc ? Yes. It no longer serves a purpose and can be removed. It's not absolutely necessary for you to remove it, but it's recommended if you're comfortable with editing your .bashrc file as it makes for a cleaner login. Our Software On Odyssey Intro has also been updated for the CentOS 7 transition and is worth re-viewing. As always, you have the ability to install your own software in many cases (especially true for R, Python, Anaconda). Please see our Installing Software Yourself page. For more information and information on legacy CentOS 6 modules, see the Running Jobs page. While it is true that some older modules will work on CentOS 7 without recompiling or rebuilding, we do not offer any guarantees on that front. You are free to try, but we have no plans to try to go back and make changes to old modules or to support their use. Use at your own risk. Having a non-standard default shell will cause problems and does not allow us to set global environmental defaults for everyone. We will no longer change the default shell on any account or support the use of alternate shells as default login shell. Users who do not have bash as their default login shell will need to change back to bash. Users can, of course, still launch an alternate shell once logged in. Still need help transitioning to CentOS 7? You can always visit our regular Office Hours which run from roughly late August until the end of May/start of June. See our Office Hours calendar.